Choosing a new cookware is never an easy decision. Moving out on your own for the first time? You need a new cookware set. Remodeling your kitchen? Tired of your old cookware? A kitchen really isn’t a kitchen without a good cookware set to match it. Today, there are so many cookware types to choose from that it might be hard to make a decision. From non-stick cookware, over cast iron and copper, down to stainless steel. Which type should you choose? Well, all types of cookware have their pros and cons, so choosing one is always a personal choice. However, for day to day use in the home kitchen, we do love hard anodized aluminum non-stick sets. When looking for a set, it helps to know a couple of basics before you start, especially if it’s your first time. For example, many people don’t know that companies count lids as pieces, so a set that contains three saucepans and three lids will count as a 6-piece set. We researched and checked out all of the most popular cookware sets available online and came up with this list of 5 best cookware sets to make your choice easier! 5 How to Choose a Cookware set? 5.1 What Does the Set Contain? 5.2 What Material is The Cookware Made of? 5.3 What Kind of Stove Will You Use the Cookware on? 5.4 Is it Dishwasher Safe? 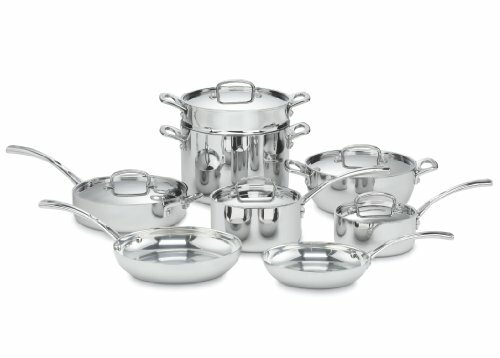 The Calphalon Premier Space Saving Stainless Steel 15 Piece Set is a set of high-quality pots and pans. 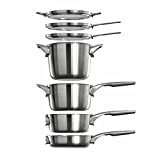 The pots and pans in this set are made of stainless steel, arguably the most durable material to have in the kitchen, and surely one of the easiest to clean. While stainless steel is highly resistant to corrosion, rust, and any kind of damage, it’s not really the best heat conductor out there. However, Calphalon offers a nice solution to this problem by bringing together the best of both worlds – a stainless steel interior and exterior with an aluminum core. Aluminum heats up much more quickly than stainless steel, so the aluminum layer sandwiched between two layers of stainless steel allows these pots and pans to respond to heat much better. The Calphalon Premier Space Saving Stainless Steel 15 Piece Set offers consistently good cooking performance, but that is not the only feature that makes it stand out. What we actually love the most about this set is the fact that it is securely stackable, allowing you to save tons of space! This is possible thanks to Calphalon’s innovative design that takes up 30% less space in the kitchen cabinet. So what exactly does this set contain? First of all, there are three frying pans. Not two as in most cases, but three, which means you will have a perfect frying pan for any occasion. The smallest one has a diameter of 8 inches, while the other two are 10 and 12 inches wide. 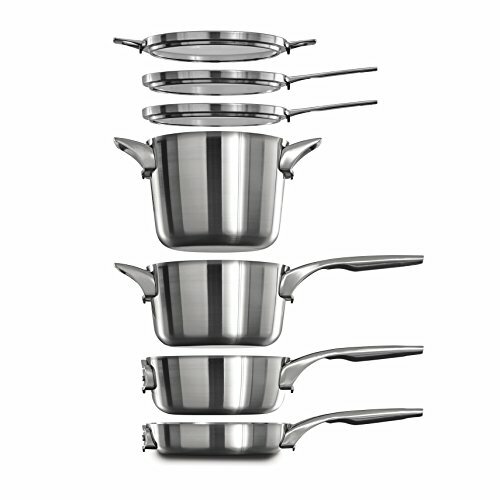 The set also contains two saucepans – the capacity of the smaller one is 3.5 quarts while the bigger one is 4.5 quarts. Finally, there is also a 3-quart saute pan, an 8-quart stockpot and a 5-quart sauteuse. You get a special tempered-glass lid with each pot (altogether six of them). These Calphalon lids are flat, which allows you to stack them nicely. All the pots and pans also have comfortable stainless steel handles that remain cool on the stovetop. Calphalon cookware is certainly not the cheapest on the market, but they do make high-quality products that can last a lifetime. And if they don’t – Calphalon actually gives you a lifetime warranty on all of their pots and pans. We really love Calphalon’s space-saving design, probably because it is so simple and yet so functional. We all know the troubles of finding space for all of your pots and pans, and let’s not get started with the bulky lids! Having more space and a tidier kitchen is really a gift. These pots and pans are not only cleverly designed, but they are also durable and highly versatile. Each of the pots and pans can go into the oven up to 450 degrees and can be washed in a dishwasher. Overall, a great choice for those who like the unusual design! 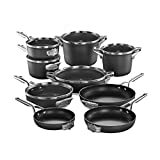 This 15-piece set is similar to the Calphalon Premier Space Saving Stainless Steel 15 Piece Set, only it’s made of heavy-duty hard anodized aluminum with a non-stick coating on the inside. Even though the pots and pans are made of aluminum, they still feature quite a heavy construction. The result is well-balanced pots and pans that really feel good in your hand! Furthermore, the aluminum core heats up quickly and the non-stick coating on the inside really works. Your food will slide right off, even if you don’t use much oil. The best thing about Calphalon’s special 3-layered non-stick interior coating is the fact that it’s extremely scratch-resistant. You can even use metal utensils when cooking which is not always the case with non-stick cookware. You can also wash all the pieces from this set in the dishwasher, which makes life much easier. This is designed in such a way that you can stack the pots the pans of the same diameter together in any order. Furthermore, the smaller ones fit into the bigger ones, of course, so you can stack the whole 15-piece set into one stack. Furthermore, what’s amazing about Calphalon’s space-saving design is the fact that they have essentially created a completely new concept of a lid. The tempered glass lids they offer are completely flat, which makes them much easier to store than standard lids. This 15-piece set contains 3 frying pans in different sizes, two saucepans, a large soup pan, a saute pan, a sauteuse, and a stockpot. This is essentially everything you need for a fully functional kitchen! You can not only prepare breakfast, lunch, and dinner for the whole family with this set, but you can also cook an elaborate multi-course meal. There is pot or pan for every use! The frying pans are perfect for breakfast foods, stir-frys and, roasting meat. The saucepans work for reheating food, making all kinds of sauces, ar small batches of soups and stews. And if you want to whip up a really large batch of anything, there is the 4.5-quart soup pan and an even larger 8-quart stockpot! It’s hard to find good non-stick cookware that is dishwasher-safe and safe to use with metal utensils, but this is exactly what you get with Calphalon Premier Space Saving Nonstick cookware. Thanks to the stackable design, this set from Calphalon is also a great choice for those working with limited space in their kitchen. KitchenAid is an American company with a long history of making life in the kitchen just a bit easier. As far back as 1919., they created their first stand-alone mixer that arguably achieved cult status among kitchen appliances. Today they make a wide range of kitchen appliances and kitchenware. KitchenAid is known for making high-quality and functional products. Their new line of 5-ply stainless steel cookware definitely shouldn’t be underestimated. The KitchenAid KC2CS10ST 5-ply Copper Core 10-Piece Set Cookware – Stainless Steel is comprised of two frying pans, two saucepans, a saute pan and a stock pot – in short, all of the cookware essentials you need to prepare tasty meals! The two saucepans, the saute pan, and the stock pot also comes with lids, of course. We really liked the design of the lids – they are a bit flatter than most other lids, but they have nice large stainless steel loop handles on top that makes lifting the lid easy and comfortable. The handles remain cool while you are cooking, so there is no risk of accidentally burning yourself. The lids themselves are made of tempered glass that allows you to see the food inside with the lid on. The tempered glass is surrounded with a stainless steel rim which fits nicely onto the pan, thus locking in the moisture and the flavors. What sets this cookware set apart from other similar items is the 5-ply copper core design. The pots and pans in this set actually have five layers. While the inside and outside exterior layers are stainless steel, inside there are two layers of copper and a sheet of aluminum sandwiched between them. Our 5-ply copper core design gives you optimum heating. Teflon platinum plus - maximum life and scratch resistant. As copper and aluminum are both great heat conductors, this kind of construction gives these pots and pans unmatched heat conductivity and responsiveness, at least when it comes to stainless steel cookware. Furthermore, thanks to the stainless steel exterior, these pots and pans are virtually indestructible. You can wash them in the dishwasher, scrub away at them in case the food burns or gets stuck, and they will remain intact. Sometimes, the problem with multi-layered cookware can be that the base warps quite quickly, that is if the cookware is not well-constructed. However, these KitchenAid pots and pans have a sturdy 18/0 stainless steel base that keeps the pots and pans from warping! Thanks to that, they can really last for a long time. The handles on all of the pieces in this set are welded on. They are made of stainless steel and designed to fit comfortably in your hand. Finally, there are etched measurement markings on the interior surface of these pots. A small detail, but really a nice touch! The KitchenAid KC2CS10ST 5-ply Copper Core 10-Piece Set contains all of the essentials needed for everyday cooking. It is well-constructed, functional, and easy to clean. It’s also compatible with all kinds of cooktops, including induction. 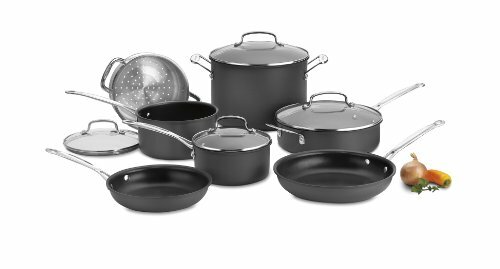 This 13-piece set from All-Clad features some of the highest quality hard anodized cookware available. Even though they are made of aluminum, these pots and pans are rather thick, resulting in sturdy construction. Furthermore, the hard anodized finish makes these pots and pans more durable, scratch-resistant, and non-reactive. However, thanks to the stainless steel base, the All-Clad E785SB64 HA1 Hard Anodized Nonstick Cookware Set is compatible with all kinds of cooktops, including induction, electric, halogen, and gas. So what exactly does this set contain? First of all, there are three frying pans, and 8-inch frying pan, a 10-inch frying pan, and a 12-inch frying pans. They all provide even heat distribution, so the food will never burn neither at the center of the pan nor at the edges. 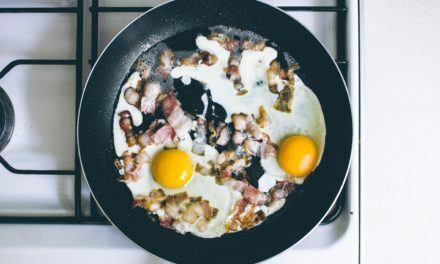 The smaller pans are perfect for making eggs, but you can, of course, use them to fry almost anything. The set also contains 2 saucepans, 4-quart soup pot, and 8-quart stock pot. The saucepans, the soup pot, and the stock pot all come with nice tempered glass lids with stainless steel handles. The pots and pans all have nice stainless steel handles that feature a special contoured design for a more comfortable grip. This 13-piece set is perfect for day-to-day home cooking. Not only this, but it also features a uniquely elegant design that will look great in any kitchen. For this reason, this set also makes a great gift for a cooking enthusiast. With the French Classic collection, Cuisinart decided to introduce a line of premium cookware that is made in France. This classic set is simple, but also elegant and functional. It will really bring a touch of class into your cookware collection! All of the pieces in this set are made of stainless steel. Arguably, cookware made of stainless steel is the most versatile and the easiest to handle in the kitchen – you can wash it in the dishwasher, you can use metal utensils… you can basically do anything you like with it. The main downside of stainless steel is that it doesn’t conduct heat very well, but the pots and pans in the Cuisinart FCT-13 French Classic set have a three-layered structured that solves this problem. The inside of the pots and pans is stainless steel, the outside is stainless steel, but there is also a layer of aluminum in the middle. The aluminum layer goes all the way up the sides of the pans which is really important since it gives you even heating across the whole surface of the pot or pan. 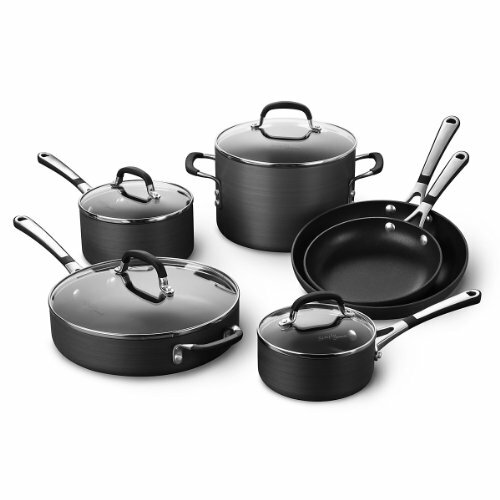 The set contains two saucepans in different sizes, a covered dutch oven, a saute pan, a stockpot, and two skillets. Every piece except the skillets comes with a lid that’s 100% stainless steel. The 8-quart stockpot also includes a pasta insert which is really handy. The dutch oven, on the other hand, is also a really nice addition. Is perfect for smaller batches of soups, for braises, and for dishes that require transferring from the stove top into the oven. The handles on the pots and pans are riveted on and it’s highly unlikely that they will ever fall off. They are also ergonomically designed to provide a secure grip. The long handles on the skillets, saucepans, and the saute pan even have a thumb notch that helps you hold the handle more securely. Finally, the Cuisinart FCT-13 French Classic Tri-Ply Stainless 13-Piece Cookware Set also comes with a lifetime warranty. The Cuisinart FCT-13 French Classic Tri-Ply Stainless 13-Piece Cookware Set is a cookware set with many advantages: it looks beautiful and elegant, it is easy to maintain, and it’s functional and versatile. It also works with induction cooktops, in case this is a concern for you. Overall, a great cookware set with high-quality construction. The motto of T-fal is simple: “make your life easier”. And that is exactly what they are doing. They started with non-stick frying pans and now they have added the Thermo-spot to the cooking surface of their pots and pans to make cooking even easier. Now, you might be wondering, what exactly is Thermo-spot and why do I need it? Thermo-spot is T-fal’s patented heat indicator T-fal adds to their cookware. It is a red circle in the middle of your pan with a circular pattern. As your pan heats up, the circle changes color and the pattern gradually disappears. Once the circle is completely red, you know that your pan has reached the cooking temperature. Now, let’s talk a little bit more about the T-fal E765SC Hard Anodized 12-Piece Cookware Set itself. The composition of this set is slightly different than other standard cookware sets. What immediately stands out is the fact that you get a 5-quart dutch oven. A dutch oven is really a great addition – it’s perfect for slow cooking, and it can go right from the stovetop into the oven which offers unlimited flexibility with cooking. The dutch oven comes with a glass lid that fits snuggly and it can go in the oven on temperatures up to 350 degrees Fahrenheit, just like all the other pieces from this set. The set also includes 2 sturdy frying pans. The diameter of the smaller one is 8 inches, while the diameter of the bigger one is 10.25 inches. Both are very good sizes for standard home cooking needs – not too big and not too small. Finally, the T-fal E765SC Hard Anodized 12-Piece Cookware Set includes not two, but three saucepans. The capacity of the smallest one is 1 quart, the middle one is 2 quarts, and the large one is 3 quarts. All three saucepans have nice long double-riveted handles with a silicone cover. The silicone is heat resistant (up to 350 degrees Fahrenheit), but it also remains cool to the touch which is great. As a nice addition, you also get a serving spoon and a slotted spatula in this set, so you truly have anything you need to cook a complete meal. 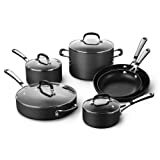 When it comes to construction, all the pots and pans in this set are made from hard anodized aluminum which makes them durable and impact-resistant. They also have a special Anti-Warp base built in, which makes them last even longer than standard hard anodized cookware. The hard anodized exterior is very hard to scratch and super easy to clean which is always great. The inside of the pots and pans is covered by a Prometal Pro non-stick layer, which is extremely tough and durable. So much so that it’s even safe to use with metal utensils. Finally, many of you will be happy to learn that it is safe to wash all of the parts of this set in the dishwasher. Overall, this is a very functional cookware set. The cookware is very well-constructed, but it also comes at a reasonable price. It’s really a good choice if you are looking for an all-purpose cookware set for everyday use. The Simply Calphalon SA10H Nonstick 10-Piece Cookware Set is another great cookware set made with hard anodized aluminum. It includes 10 pots and pans altogether, with hard anodized exterior and non-stick interior. 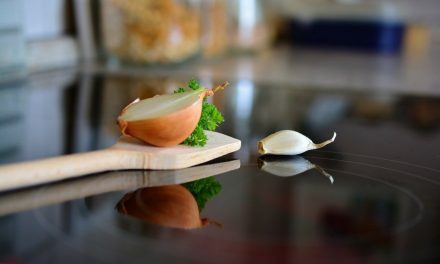 It is not compatible with induction stovetops, but it works great on electric stoves, glass top stoves, gas stove, and basically any other kind. So what makes the Simply Calphalon SA10H Nonstick 10-Piece Cookware Set stand out? At first glance, it is obvious that this is a sleek, classic-looking cookware set. The hard-anodized exterior with a brushed finish gives these pots and pans a gorgeous, elegant look. However, it’s not just about the looks. The hard anodized surface is extremely dense, which makes it tougher even than stainless steel. Furthermore, it’s also non-porous which makes it easy to clean. The inside of the pots and pans is coated with Calphalon’s special dual-layered non-stick coating, which makes the food slide right off! 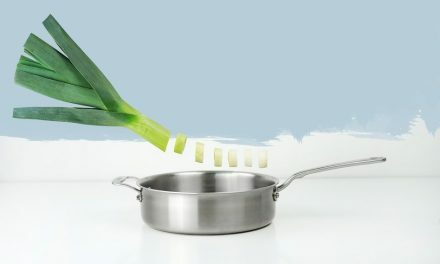 You don’t need to use any oil when cooking either, which is important if you are trying to make your cooking healthier. The non-stick coating is PFOA-free, which means there is no need to worry about harmful chemicals being released while cooking. The coating itself is very nice and durable, but if you want to keep it in a good state, you should use wood or silicone utensils instead of metal once. It is also not recommended to wash these pots and pans in the dishwasher in order to avoid damaging the non-stick surface. However, the non-stick coating works so well that cleaning the pots and pans by hand is really no problem. So what exactly does this 10-piece set include? As is usually the case, you get two frying pans in standard size, the smaller one is 8 inches wide while the diameter of the larger one is 10 inches. Two different-sized saucepans are also included, as well as a 3-quart saucepan and a 6-quart stockpot. Furthermore, the two saucepans, the stockpot, and the saute pan all come with nice tight-fitting lids. The lids are made of tempered glass which also makes them safe to use in the oven at temperatures up to 450 degrees Fahrenheit. No matter if you are looking for a starter set or just looking to update your collection of cookware, the Simply Calphalon SA10H Nonstick 10-Piece Cookware Set is definitely a great choice. It is a bit more expensive than other cookware sets on our list, but the quality and durability of these pots and pans definitely make up for the price difference. The Cuisinart 66-11 Chef’s Classic Nonstick Hard-Anodized 11-Piece Cookware Set is one of the best and most functional cookware sets on our list. All the pots and pans are made of hard anodized aluminum which is arguably one of the best materials when it comes to cookware sets for everyday home cooking use. The exterior of the pots and pans has a nice graphite finish which gives them an elegant look. Furthermore, all the pots and pans also have a heavy aluminum base which allows them to heat up evenly without hotspots. Aluminum is among the best heat conductors, so the also heat up really quickly. When it comes to the inside layer, the cooking surface is covered with a quantanium non-stick coating which is reinforced with titanium. This innovative non-stick coating is unique to Cuisinart and it’s quite durable and reliable. It provides amazing food release and it doesn’t get damaged easily. You can even use metal utensils without worrying about scratches. All the pieces in the set also include solid stainless steel handles which are oven-safe and quite stable. When you pick up a pot or pan from this set and hold it in your hand, you’ll immediately notice that it is really well balanced. It just feels good in your hand. This might be a small detail but it really makes a difference in the overall cooking experience. One thing that makes the Cuisinart 66-11 Chef’s Classic Nonstick Hard-Anodized 11-Piece Cookware Set stand out among the competition is the fact that every detail has been designed with care. The tapered rims on the pots and pans are proof of this. The rims are slightly thicker at the top, which allows for drip-free pouring and makes the lids fit really tight. So what exactly do you get if you buy this 10-piece set? First of all, there is an 8-inch frying pan and a 10-inch frying pan. We simply love these pans because of the non-stick coating which makes them perfect for eggs. This doesn’t mean you can’t use them for anything else you’d like, though. A large saute pan is also included. It has handles on both sides, which is really important when you are cooking large quantities of food. Finally, there is also a small saucepan, a medium-sized saucepan and a large, 8-quart stockpot. Four tempered glass lids with stainless steel handles are also included. Even though there are six pots and pans altogether, you really need only four lids since the two biggest lids fit on the stockpot and the saute pan, respectively, but they also fit the two frying pans. As a nice addition, a stainless steel steamer insert is also included in this set. Finally, the pots and pans in this set are oven-safe on temperatures up to 500 degrees Fahrenheit, which is exceptionally high. However, the lids shouldn’t go in the oven if the temperature is over 300 degrees Fahrenheit. Overall, this is a nice, functional set. It comes with all the pots and pans you need to cook breakfast, lunch, and dinner for the whole family. Buying this set is certainly a decision you will not regret. Rachael Ray’s kitchenware collections are all about simple solutions that make your life easier and cooking more fun. The Rachael Ray Cucina Hard Porcelain Enamel 12-Piece Nonstick Cookware Set is just that – simple, functional, and easy to use, which brings it to our list of best pots and pans for glass top stoves. All the pieces are made of aluminum which makes them lightweight but still sturdy enough to survive everyday kitchen use for years to come. Furthermore, aluminum is one of the best heat distributors which means these pots and pans are highly responsive to heat allowing for precise temperature control while cooking. The aluminum provides good heating properties, but it will not touch your food thanks to the inside non-stick coating on all of the pots and pans in this set. The non-stick coating is PFOA-free which means it’s completely safe. This 12-piece set contains everything you need for everyday cooking needs. It contains two saucepans with lids in different sizes, a large stockpot, a 3-quart saute pan, and two skillets. The stockpot and the saute pan also come with shatter-resistant transparent lids that allow you to keep an eye on the cooking process without having to remove the lid. The smaller saucepan has a capacity of 1 quart which makes it a universal helper in the kitchen – whenever you need to heat up something, like water or milk, or prepare food for one. And if you need more space, the larger 3-quart saucepan will do the job. One feature that stands out on the Rachael Ray Cucina Hard Enamel collection is the colorful appearance of the pots and pans. Agave Blue and Cranberry Red are our favorites, but you can also choose from Lavender, Mushroom Brown, Pumpkin Orange and Sea Salt Gray. The hard enamel exterior looks amazing and comes in 6 different modern colors. The rubberized double riveted handles match the color of the exterior layer. They are soft and comfortable to hold but still provide a firm grip. The pots, pans, and lids can be used in the oven on temperatures lower than 400 degrees Fahrenheit. They are compatible with all kinds of stovetops except induction. The only slight drawback is that they are not dishwasher-safe, but with the non-stick coating the food slides off so easily that washing by hand won’t be a problem. Overall, this is a nice, functional set. It comes with all the pots and pans you need to cook breakfast, lunch, and dinner for the whole family. There are two pans, so you can always make omelets or pancakes or both for breakfast, and with the large stockpot and a saute pan, you can even prepare dinner for a crowd! Most importantly, we guarantee you’ll be amazed by how easy the cookware in this set is to clean, both on the inside and on the outside. This set is available in black, lavender, red, and turquoise. The inside of the pots and pans is white, but you can get the black version with black inside layer also it this is more your style. The inside layer is Thermolon ceramic non-stick which is free of PFOA, PFAS, lead or cadmium. Most standard non-stick coatings are safe to use but only up to a certain temperature. If the cookware overheats, the non-stick coating starts releasing harmful chemicals. However, the Thermolon ceramic non-stick coating remains safe even if you overheat the pan. Just like most cookware sets, this set includes 2 saucepans, a stockpot, and a saute pan. What makes it different, though, is the range of frying pans you get. There is a 7-inch frying pan, a 9.5-inch frying pan, but there is also an extra-small 4-inch frying pan which really comes in handy when cooking for one. Finally, 4 utensils and a stainless steel steamer are also included. This is one of the most versatile and fun sets we have found. The extra-small pan is great when cooking for one, and you get a steamer insert and utensil when you buy the set. What more could you need? When choosing a cookware set for your kitchen, there are a couple of things you should take into consideration in order to make the right choice. First of all, you should think about what kind of food do you usually cook? Also, for how many people do you tend to cook most often? Just for one or for a family of five? All these things are important when choosing a cookware set, especially if you want to avoid stuffing your kitchen with cookware you don’t use. The truth is, a 10-piece or a 12-piece cookware set can completely satisfy the cooking needs of most people. However, not all sets are identical. Most of them include two small saucepans and at least one frying pan, and these are usually useful for anyone. However, some sets will come with special additions. The GreenLife Soft Grip 16-piece Ceramic Non-Stick Cookware Set, for example, includes a 4-inch frying pan and a steamer tray. If these are pieces you could use often in your daily cooking, you should opt for this set. Furthermore, some cookware sets are dishwasher-safe while others are not. T-fal E765SC Hard Anodized 12-Piece Cookware Set and GreenLife Soft Grip 16-piece Ceramic Non-Stick Cookware Set are both dishwasher-safe. If this is something that is important to you, you should definitely consider these two. Some other sets. Finally, we believe that all the cookware sets in our top 5 list have their advantages. Whichever you choose, we hope this article has helped! Indiction cookware is safe and efficient. But induction hobs need specialist induction cookware. Read our reviews of the best induction cookware sets. Ceramic is lightweight, safe, colorful and good value for money. Read our reviews of the best ceramic cookware sets. Stainless steel is reliable, easy to clean, incredibly durable, safe and healthy to cook with. It looks great too! Read our reviews of the best stainless steel cookware sets. We’ve researched and tested some of the most popular non-stick cookware sets available today. Read our reviews of the best non-stick cookware sets. Copper cookware heats up and cools down fast which allows for very precise heat control. 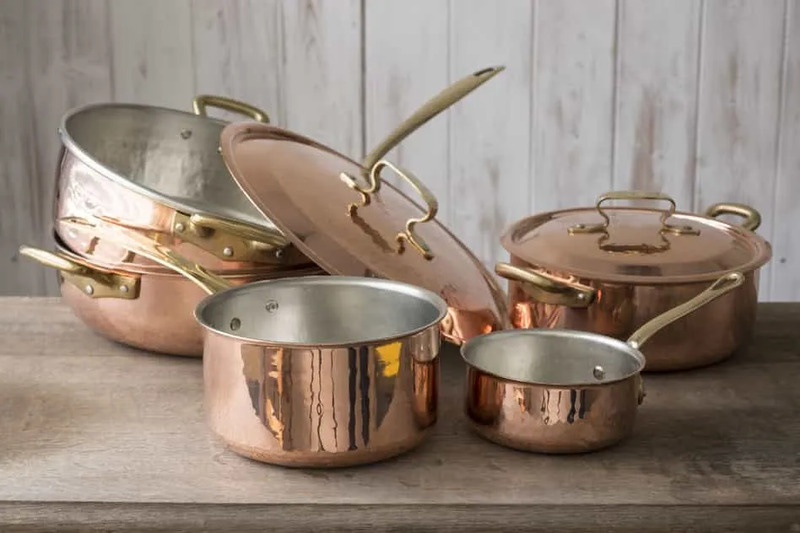 Read our reviews of the best copper cookware sets. Cast iron is heavy, hard-wearing and suitable for all kinds of heat and heat sources. It is perfect for the oven and for very high heat on the stove. Read our reviews of the best cast iron cookware sets. 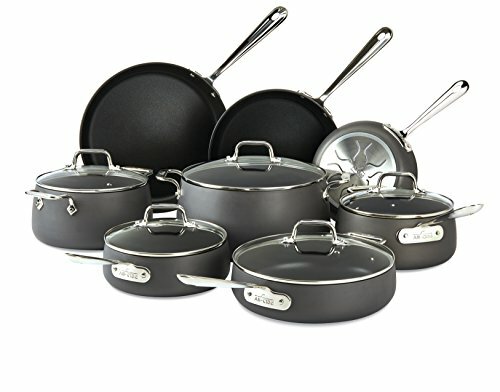 How to Choose a Cookware set? First of all, you’ll need to decide how many pieces you want the set to have. You don’t want to end up with too many pots that you almost never use, but having all of the essentials within the set is important. The truth is, a 10-piece or a 12-piece cookware set can completely satisfy the cooking needs of most people, while a 15-piece set should be enough to cook meals for the whole family. The GreenLife Soft Grip 16-piece Ceramic Non-Stick Cookware Set, for example, includes a 4-inch frying pan and a steamer tray and the Cuisinart FCT-13 French Classic Tri-Ply Stainless 13-Piece Cookware Set includes a pasta insert for the stockpot. If these are pieces you could use often in your daily cooking, there is no reason not to choose this set. What Material is The Cookware Made of? All of the cookware sets on our list are made either of stainless steel or aluminum. This is because the cookware made of these materials is tough, versatile, and perfect for everyday use. Of course, there are differences between aluminum and stainless steel. Stainless steel is heavier than aluminum, but also more impact-resistant. Stainless steel pots and pans keep their shape even after years of use. Stainless steel is also, as the name suggests, completely resistant to corrosion and rust. Stainless steel is not the best heat conductor, though, but this problem can be solved by adding a layer of aluminum or copper in between layers of stainless steel. The Cuisinart FCT-13 French Classic Tri-Ply Stainless 13-Piece Cookware Set, for example, has a layer of aluminum in its core, and the KitchenAid KC2CS10ST 5-ply Copper Core 10-Piece Set features as many as five layers. On the other hand, aluminum is lighter, it heats up quickly, and it’s highly responsive to heat changes. Aluminum cookware is usually covered with a non-stick coating. Depending on the coating, you might not be able to wash this type of cookware in the dishwasher or use metal utensils in order not to damage the non-stick layer. Hard anodized aluminum is aluminum that has undergone a specific treatment that makes it harder and non-reactive. What Kind of Stove Will You Use the Cookware on? Before settling on a cookware set, you should definitely check if it is compatible with the type of hob you are using. Electric and gas stoves are compatible with all types of cookware, but this is not always the case with glass top and induction stoves. After all, you wouldn’t want to buy a whole set only to discover that you can’t use it on your stove! With glass top stoves, it is important to look for heavier cookware that has a flat bottom. You should also make sure that there is nothing that could scratch the bottom. While all kinds of cookware should generally work with glass top stoves, for best results you’ll want to look for the best fit. Induction stovetops are a bit trickier. Due to the specific heating technology, they only work with magnetic cookware that has a flat bottom. Stainless steel works with induction, but aluminum does not. 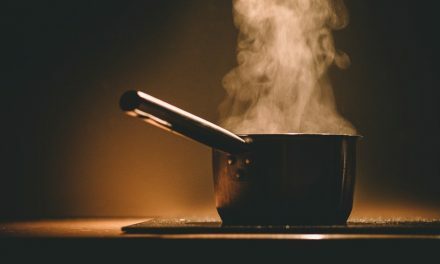 Cookware made of other metals like copper and aluminum can be made to work with induction stovetops by adding a stainless steel layer at the base. The KitchenAid KC2CS10ST 5-ply Copper Core 10-Piece Set is made of hard anodized aluminum, but it also works on induction stovetops thanks to the stainless steel base! Some cookware sets are dishwasher-safe while others are not. 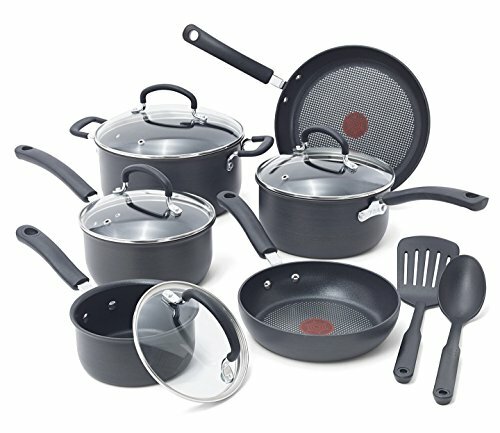 T-fal E765SC Hard Anodized 12-Piece Cookware Set and GreenLife Soft Grip 16-piece Ceramic Non-Stick Cookware Set are both dishwasher-safe, as well as all of the premium sets. If this is something that is important to you, you should definitely consider these two. Finally, we believe that all the cookware sets in our list have their advantages. Whichever you choose, we hope this article has helped! 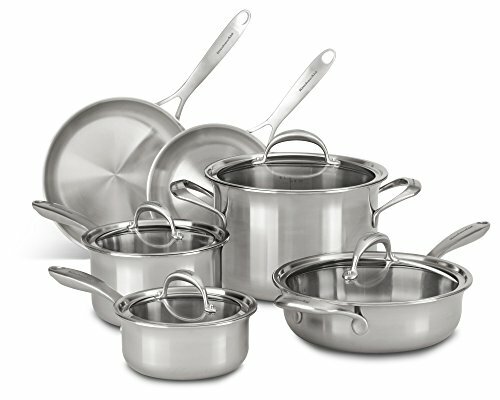 NextWhat Utensils to use with Stainless Steel Cookware?